A multi-year plan to make Dallas a more resilient city was revealed at Dallas City Hall last week. Courtesy of Storyblock. A major, multi-year plan to make Dallas more equitable, prosperous and greener called Resilient Dallas was revealed at Dallas City Hall last week. This is the city’s roadmap to recreate Dallas as one of 100 Resilient Cities globally, selected by the Rockefeller Foundation and awarded funding and technical assistance from the Rockefeller Foundation valued at more than $100 million. Resilient Dallas is led by Theresa O’Donnell, city planner and the city’s Chief Resilience Officer, and culminates from a three-year effort. The plan forms a framework of goals, actions and partnerships to make Dallas resistant “to the physical, social and economic challenges that are a growing part of the 21st century...from chronic problems to acute shocks,” as the 100 Resilient Cities website explains. The “problems and shocks” that came to the mind of local environmentalists at the briefing included unprecedented heat, extreme storms and flooding exacerbated by climate change, as well as unhealthy air. So did “climate resilience,” the capacity to withstand impacts of climate disruption. Some are addressed in “Resilient Dallas,” the plan’s 65-page blueprint, but the subtitle “Dallas’ Path to Shared Prosperity” reveals the main thrust of its seven goals. Here’s brief comment on the effort’s prosperity and equity goals and on environmental ones of special interest to GreenSource readers. 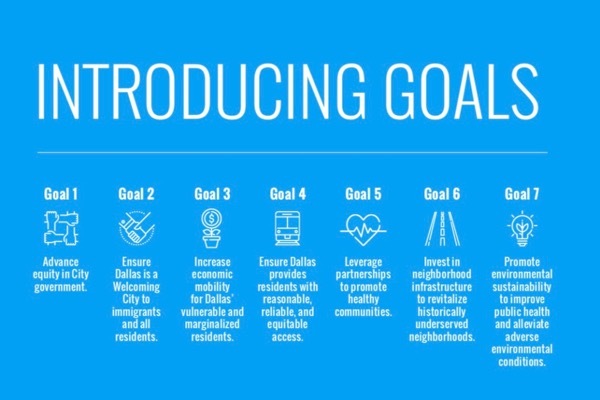 One, advance equity in City government through hiring practices and by incorporating equity into planning; two, ensure Dallas is a welcoming city to immigrants and all residents; three, economic equity, mostly through workforce readiness efforts and financial education. Fourth is transportation equity in “our public transportation system that inadequately moves people who must use it,” as O’Donnell described DART. Five, leverage partnerships for community health; six, invest in neighborhood infrastructure to revitalize low- and moderate-income neighborhoods; seven, promote environmental sustainability to improve public health and alleviate adverse environmental conditions. “There’s great work being done by nonprofits and environmental organizations in this city,” said O’Donnell. Leveraging those efforts, four initiatives are already underway as part of Resilient Dallas. Breathe Easy Dallas launches in nine area elementary schools in September. The Nature Conservancy and Dallas ISD are collaborating on this air quality study to assess the impact of poor air quality on childhood asthma and asthma-related absenteeism from school. “Black kids in Dallas have an asthma rate eight times higher than Asian children and four times higher than whites,” pointed out O’Donnell. “Air-monitoring results will be available to students, families and the public in real time via the city’s SmartCity platform, once the system is tested and secure,” said James McGuire, managing director of the Office of Environmental Quality, in a later interview. To reduce flooding, a comprehensive map to be based on existing flooding and drainage analyses across Dallas will identify gaps and “nature-based” solutions in a partnership of The Nature Conservancy, The Trust for Public Land and Texas A&M AgriLife Research. High-tech design of runoff-collecting rain gardens and swales has been an AgriLife Research focus for more than a decade. For neighborhoods vulnerable to the urban heat island effect, poor water quality and poor air quality, partners will pilot use of targeted tree plantings and green stormwater infrastructure, and create better access to open space. The Nature Conservancy, Texas Trees Foundation and Dallas’ Office of Environmental Quality are collaborating. As for the unprecedented heat, extreme storms and flooding and unhealthy air that affect the entire city, OEQ is charged with an expanded mission for its fifth inventory of greenhouse gas emissions, the driver of climate change that’s worsening those hazards. “The GHG inventory is 95 percent complete,” said McGuire in a later interview. Before year-end is OEQ’s target time to present the GHG data and possible mitigation strategies for review by a City Council committee, likely Quality of Life, said McGuire. “A market-driven approach is one that recognizes that Texas is a renewable energy leader… that there is a cost of business of acquiring and transporting raw materials to areas where they've been ravaged by a storm. It's one that recognizes the risks of business when there is extreme heat for workers and for infrastructure,” McGuire replied. He declined to name specific examples of possible emission-cutting strategies. Rita Beving of Public Citizen, the national consumer advocacy nonprofit, congratulated Dallas Mayor Rawlings for having signed the U.S. Conference of Mayors climate agreement in spring of 2017, responding to President Trump’s announcement he would withdraw the U.S. from the Paris climate agreement. However, an analysis of U.S. cities who followed up their climate commitment with a climate action plan wasn’t favorable to Dallas, she said. Seventy-five U.S. cities were studied by the Mayors National Climate Action Agenda, an association of U.S. mayors with the stated goal of reducing greenhouse gas emissions. Sixty had climate action plans. “Dallas is 57, third from the bottom. Austin is second in the nation, Houston is number 40,” reported Beving. McGuire noted that the MNCAA analysis dates to 2016. Partnering organizations for the climate-impact mitigation initiative are identified only as “environmental conservation organizations,” unlike the other initiatives in Resilient Dallas’ published strategy. The door is still open. Members of North Texas Clean Air Network, a university-nonprofit effort also working on air monitoring, have met with OEQ, as well.